This being a riding tour, Aimee and I decided it was time to get ourselves on a horse. We had planned a trip out of Budapest to stay at Debrecen (Debreton) which, I am sure you will be interested to know, is Hungary’s 2nd largest city. Being the highly organised well oiled travelling machines that we are, at 8pm the night before the scheduled trip we had not organised a hire car. Hiring a car is more difficult than it sounds- what with that tiny wee language barrier, and the fact Hertz isn’t exactly all over Hungary. Without Vanda, we would have had no chance, and she patiently called around a bunch of places and asked all the appropriate questions. Well, lo and behold, we ended up with another Suzuki-it kinda resembled a courier van, (but with wheels from a ride on mower), and with this mighty? steed, off we went to the wilds of….. a Hungarian motorway. Indicators are ….hang on, what are indicators? Hungarians have a mandate from Istan (God) to drive as fast as they like in the fast lane. If you are in the fast lane and a car comes up behind you, you MUST move over even if it means slamming on the brakes to squeeze between two enormous trucks in the right hand lane. Rule 4 applies even if you are in road works, and there is only 1 lane. Mum, please just stop reading this next bit. We were feeling pressured to do 90km in an 80km road work zone, where one lane was closed. A very impatient B-double truck decided not to worry that we were going so slow- by just over taking us…. on the inside lane…. that wasnt a lane, but the shoulder of the road. Now, imagine every road trip movie or cartoon where the people in the car yell “Aaaaaaaaaaahhhhhhhhhhhaarrrrgh’ as the truck thunders by, then stare at each other open mouthed. Did I mention it was raining? Hard?!! Well, despite this and several other brown trouser moments, we lived to tell the tale, and arrived at our destination safe and well (thanks entirely to having a GPS). Only problem was, we were too stooopid to realise that what looked like an enormous mansion was in fact a) a University and b) where we were staying, so we drove around Debrecen for another hour, all the while our once-friendly-now-possessed GPS trying to send us back to Budapest…. After a frustrating hour looking for what we had already found, and a long tiring terrifying drive, we were keen for a little quiet time in our room. An hour later, we were gagging for it-it took that long to check in, what with Aimee being sent back and forward between two buildings, the receptionist at each insisting the other was responsible. I’d parked somewhat awkwardly and illegally in the middle of the dorm courtyard. 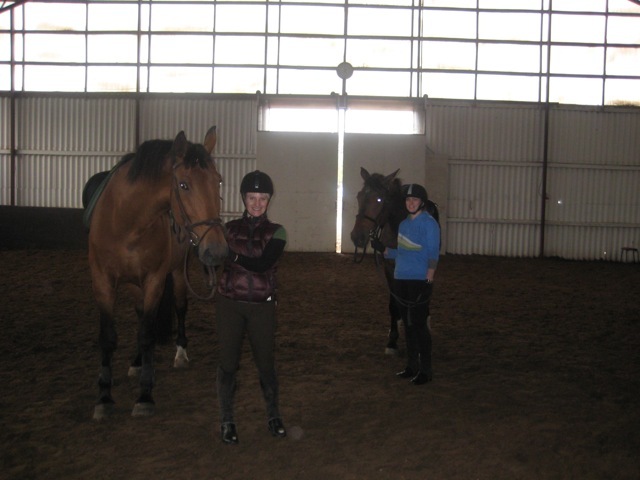 After finally making it to our dorm room, we decided to be proactive and find a riding school for the next day. Apparently, Debrecen was packed with them. Somehow, we not only failed to find any riding schools, but spent another hour trying to get back to our room. 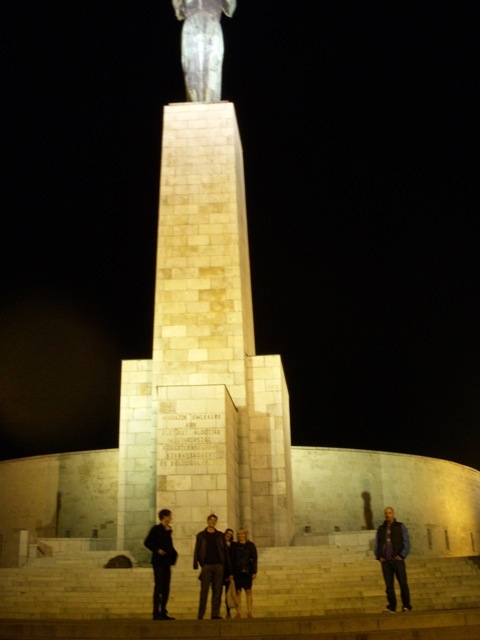 So, with these discouraging attempts under our belt, the next day we left the accursed Debrecen (surely the Brigadoon of Central Europe) and made out way to Hortobagy, home of Hungary’s first national park and the Mata Stud, Hungary’s National Stud/Horse Centre. Now, Hungary has a long history, and you may not be aware that the oldest inhabitants of the region were called the Magyars. Much of Hungary is very flat and has extensive grasslands- called the Puszta or Great Plains. Hungary is country that is wedged between a number of strategically important areas, and thus other nations and peoples have been trying to make it theirs for hundreds of years (you may recall that once Hungary was part of the Austro-Hungarian Empire, when those greedy Austrians ruled a massive chunk of Europe). Where am I going with all this, I hear you say? Well, many of the traditions of the Magyars are horse related. Having teed up a riding lesson, I endeared myself to our instructor by use of a well timed ‘semmi problemma’ in response to him saying he was running a little late. He sent us down to the arena to wait, where, to our delight, were the Magyar Horsemen of the Puszta, all decked out in traditional costume, with their horses. Those mounted on horseback have saddles BUT…. no girths!!! (for all my non horsey friends, this is the bit that holds the saddle ON to the horse. We in the outside world are quite attached to it). They get their horses to lie down on the ground to hide in the tall grass to hide from the enemy. They can also ‘crawl’ along on the ground, or will lay there while their rides stand on them (I guess to shoot arrows or something). One guy ‘rides’ 5 horses at once. 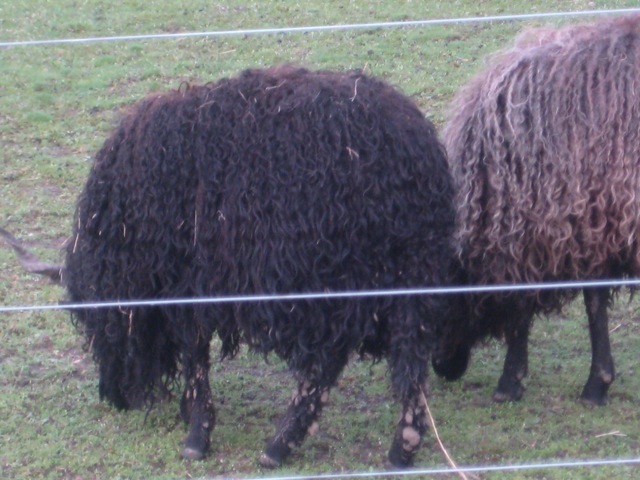 3 are at the front, two at the back, and all attached by a sort of harness. The rider stands with one foot on each of the two back horses butts, just above their tails, and drives then all along. That’s crazy! A little swing apart and that man is doing the splits! So, we are standing there gawking at these men, when one rides over to me on his girthless saddle, and motions that I should jump up behind him. I thought about that for, oh, NOT A SECOND and got up. Talking quietly to the horse, we cantered around and around the arena in circles that got ever smaller. I must say…. it was something of a holy experience for me. I mean, virtually nobody even gets to see their shows, let alone ride with one of them. I could hardly believe that it was happening. To top off this unexpected experience, we had been riding our horses (and mine was the biggest horse I have EVER ridden- it made Pharlap look like a Shetland) for about 10 minutes, when we stopped to watch the Magyar show (an unexpected bonus!) The fellow riding the 5 horses galloped so close to Aimee that she felt the breeze go by. Twas quite surreal. Back in Budapest, Vanda, Devine and I visited a blind museum, which had you completely in the dark for 45mins, going round ‘rooms’ and ‘streets’ and feeling things (frequently each other). I did feel sorry for the poor girl who came alone and got inadvertently groped by us many times. Ironically, this was a very enlightening look into the world of the blind. We also spent a lazy afternoon soaking in Hungary’s famous thermal baths and saw a few sights there that were perhaps best left unseen…. It was a clothing optional spa and plenty of Hungary’s older larger ladies were pretty keen to get their kit off. Aimee and I will always enter steam rooms with considerable caution in the future. Britenbush, eat your heart out. 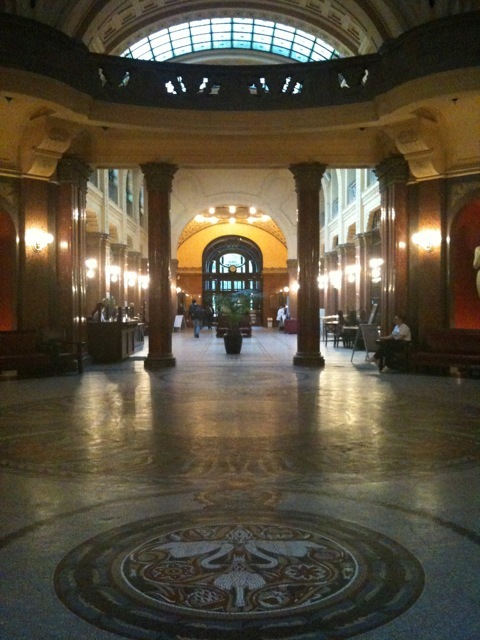 Inside on of Budapest's famous bath houses. Caution: ladies steam room contains winkers. All too soon it was Friday night, our last in Budapest. 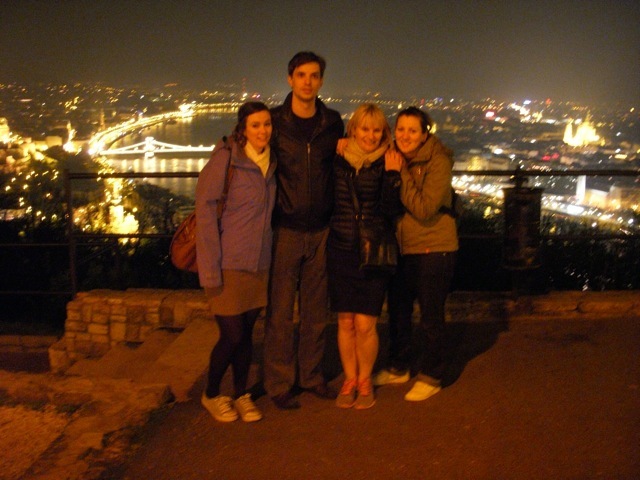 With Marton, Vanda, Vincy (our new BFF) we climbed to the top of the Citadella, where there are amazing views of Budapest by night. The city is truly beautiful, thanks in part to the aptly named Beautification Committee, who between 1803 and 1853, did considerable town planning, including the creation of many buildings in the classical Renaissance style along the Danube. 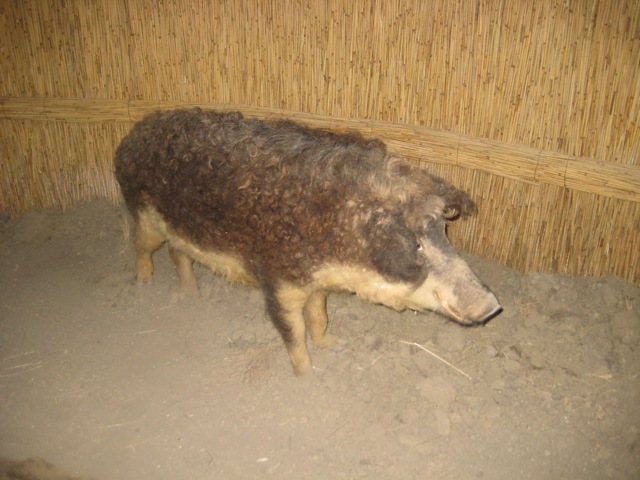 They also preserved many buildings from earlier periods- yes we did eventually make it to the Budapest History museum! They also united the two cities of Buda and Pest (pronounced Pesht) and made it the capital of Hungary. By 10am the next day we were on the train to Prague with a few tears in our eyes and bottles of some famous (but lethal) Hungarian drink from Marton in our hands. "That's right. 19 Euro on the train, Budapest to Prague. Yeah, I'm talking to you on a foil croissant phone"
Vanda, Vincy and Marton, you are all vanderful, thank you so much for your amazing hospitality we miss you already and can’t wait to see you all again. Give Dodo a big villa from me.